Esme Silver has always taken care of her charming ne'er-do-well father, Ike Silver, a small-time crook with dreams of making it big with Bugsy Siegel. Devoted to her daddy, Esme is often his "date" at the racetrack, where she amiably fetches the hot dogs while keeping an eye to the ground for any cast-off tickets that may be winners. In awe of her mother, Dina Wells, Esme is more than happy to be the foil who gets the beautiful Dina into meetings and screen tests with some of Hollywood's greats. When Ike gets an opportunity to move to Vegas—and, in what could at last be his big break, to help the man she knows as "Benny" open the Flamingo Hotel—life takes an unexpected turn for Esme. A stunner like her mother, the young girl catches the attention of Nate Stein, one of the Strip's most powerful men. Narrated by the twenty-year-old Esme, The Magnificent Esme Wells moves between pre–WWII Hollywood and postwar Las Vegas—a golden age when Jewish gangsters and movie moguls were often indistinguishable in looks and behavior. Esme's voice—sharp, observant, and with a quiet, mordant wit—chronicles the rise and fall and further fall of her complicated parents, as well as her own painful reckoning with love and life. 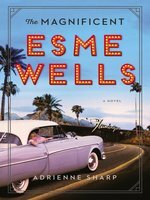 A coming-of-age story with a tinge of noir, and a tale that illuminates the promise and perils of the American dream and its dreamers, The Magnificent Esme Wells is immersive, moving, and compelling. Adrienne Sharp is the critically acclaimed author of the story collection White Swan, Black Swan, a Barnes and Noble Discover Book and a national bestseller; the novel The Sleeping Beauty, a Barnes and Noble Discover Alumni book and one of Booklist's ten best first novels of 2005; and the novel The True Memoirs of Little K, a finalist for the California Book Award and translated into six languages. 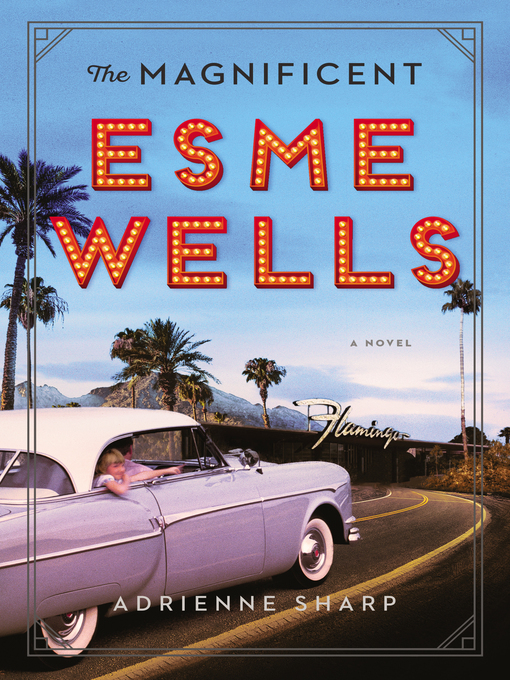 The glamour of pre–WWII Hollywood and the glitz of postwar Las Vegas are the playgrounds of young Esme Wells and her dreamer parents—her small-time crook and unlucky bookie father, and her mother, a movie star wanna-be who never gets past showgirl roles in B-musicals. Sharp’s fourth novel (following The True Memoirs of Little K) is a grimly sad story of big dreams, bad luck, and worse decisions, as Esme and her parents move from Hollywood’s scams and cheesy musicals to the Las Vegas world of casinos, high rollers, suckers, and gangsters. By 1945 Esme’s father works for mobster Bugsy Siegel as the gangster’s vision of a gambling city comes true, exposing young Esme to power, money, greed, and violence. Underage, she works as a casino cigarette girl, where her good looks draw the leering attention of Nate Stein, a ruthless thug who intends to take over all of Las Vegas. After Bugsy is bumped off, Esme falls in with serious mobsters like Stein, Mickey Cohen, and Meyer Lansky, eventually becoming Stein’s teenage mistress and chorus line showgirl, despite her father’s warnings. When Esme discovers her father’s involvement with the less-than-legal dealings, the story builds to a dangerous boil. Sharp’s narrative is a bold and gritty portrayal of unreachable dreams, anchored by its notable depiction of Esme. The daughter of two beautiful losers--a snakebit Jewish gambler and a chorus girl--comes of age in late 1930s Los Angeles and early 1950s Las Vegas.A blonde, blue-eyed child of 6, Esme Silver has not yet been enrolled in school, which doesn't mean she's not getting an education. She spends her days on the MGM lot with her mother and at the track with her father; she's known to the regulars at both places. One of her rituals is to purchase lunch at the track's concession stand for her father and herself, four hot dogs for 40 cents; the counter lady often combs out her hair and washes her face. "I can only imagine what compelled her ministrations, what I must have looked like, hair unbrushed, shirt on backwards, my neck strung with a hundred necklaces in imitation of my mother, a silk flower pinned to my wild coiffure." In one track of this story, 20-year-old Esme recalls the events of 1939 that culminated in her moving with her father to Las Vegas, where he was employed by Ben "Bugsy" Siegel. The second track follows Esme's own career in Vegas, which takes off when she's noticed at age 15 by Nate Stein, an ambitious and ruthless Jewish gangster. Stein is fictional, but many of the characters are real, including cameos by Judy Garland, the Andrews Sisters, and Busby Berkeley. Sharp's (The True Memoirs of Little K, 2010) research shines in her detailed descriptions of the MGM productions Esme's mother plays in and the Vegas extravaganzas that feature Esme herself. "The Stardust's...stage was larger than a basketball court, with an Esther Williams-like swimming tank for summer shows and Sonja Henie-like skating rink for winter ones. The pipes secreted in the catwalks created rain or snow on demand." If you liked Jennifer Egan's Manhattan Beach, this novel offers a similarly immersive mid-20th-century experience, featuring a heroine as interesting, tough, and tragic as Egan's Anna Kerrigan, with similar Daddy issues and gangland connections.This glittering noirish tragedy, with its lushly imagined period landscape and subtle feminist trajectory, is both fun to read and sad to think about. Booklist (starred review) "Sharp's novel, like Jennifer Egan's Manhattan Beach (2017), is propulsive and profound." Ann Hood, author of The Book That Matters Most and The Knitting Circle "Consider it your good luck to join Esme Wells as she comes of age with the glamour, gangsters, and big dreams of Hollywood and Las Vegas of the 30s and 40s. Like its narrator, this novel is magnificent." Jennifer Gilmore, New York Times bestselling author of Golden Country and The Mothers "Adrienne Sharp sure can WRITE! And her newest novel, The Magnificent Esme Wells, does all the best things: it transports, amuses, delights and heartbreaks. What a gem of a book." Kirkus Reviews (starred review) "This glittering noirish tragedy, with its lushly imagined period landscape and subtle feminist trajectory, is both fun to read and sad to think about." Donna Seaman, Booklist (starred review) "Esme's dramatic and irresistible story sparkles with psychological nuance, sumptuous detail, and vivid historical perceptions as Sharp tracks the high wattage success and violence of tough Jews building movie and casino empires while Hitler bloodied Europe. With real-life figures, mushroom clouds rising from desert test sites, and arresting insights into the power and vulnerability of a daring woman performer, Sharp's novel, like Jennifer Egan's Manhattan Beach (2017), is propulsive and profound. " Janet Fitch, New York Times bestselling author of White Oleander "Adrienne Sharp brilliantly recreates the tawdry magic of twin dream machines, studio-era Hollywood and early Las Vegas, in this tale of . . . the scrappy, precocious Esme Wells, her go-for-broke parents, and the toll these dreams took on their dreamers." Rosellen Brown, author of Before and After "How Esme keeps her head, if not her innocence, among these fast-living, fast-dying Vegas and Hollywood stars makes Adrienne Sharp's novel fascinating and rich with secrets she tells with wit and gusto." Ayelet Waldman, author of Love and Treasure "This lovely novel, alternately dark and funny, is a powerful examination of both the nature of love and the will to survive." Caroline Leavitt, New York Times bestselling author of Pictures of You and Cruel Beautiful World "Violent and voluptuous; heartbreaking and profound, The Magnificent Esme Wells is about the losses we endure, and the love we keep betting on, despite the odds. Truly, a showstopper." Louisa Ermelino, Publishers Weekly "Esme is street-smart and tough but vulnerable. . . . a memorable character in an unforgettable era." Ron Carlson "[I]n this lush saga of the new American West... Adrienne Sharp has given us a protagonist to hope for and a powerful new version of the American dream."